Celebrating 10 years of ARIEL ATOM production, a new special edition of this amazing and successful ‘No Screen, No Roof, No Doors’ pure sportscar is to be revealed at the Autosport International at the NEC in January – the ARIEL ATOM MUGEN. The result of collaboration between these two great names in high performance engineering is a limited-edition, track focussed car aimed at the enthusiast who wants the ultimate trackday car which can still be driven on the road. 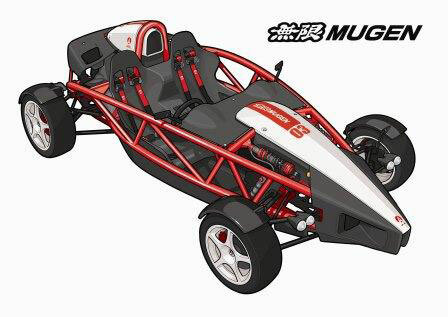 MUGEN extensively re-works the HONDA K20Z Type R engine fitted in the ATOM with a number of special new components to significantly improve both top-end power and through-rpm-range torque. Particular attention is paid to re-mapping of the ECU to provide the instant response that makes a tuned normally-aspirated engine such a joy to drive.